Woodstock Hardware is proud to be an approved dealer of Emtek Hardware. Emtek is a world leader in durable, long-lasting, top-quality door lock, door hardware, and cabinet hardware products. On their website, you will find a selection of hardware, hinges, knobs, pulls, stops, and even bells. 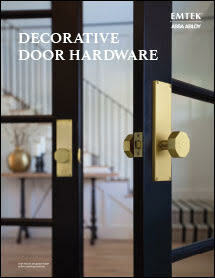 Finishes range from crystal door knobs to oil rubbed bronze door handles. Emtek Hardware reviews state that the easy installation and long-lasting quality keep consumers coming back to them for all of their hardware needs. If you are interested in ordering Emtek products, please stop by the store or call us at (845) 679-2862, or Contact Us by email to let us know about your special-order needs.